Are you sensing a theme here lately? Honestly, we’ll get back to travel soon enough. It’s just this darn cold spell that’s hit New York has me lately wanting nothing more than a good curl-up on the couch with comfort foods of my own devising. Inspired by a recent late-nite snack of roasted brussel sprouts with lardons down at Odeon, I got the hunger to make my own. This oft-maligned vegetable is one of my favorites, but roasting seemed a little too predictable for me. Childhood memories of mushy, over-boiled “baby cabbages” are probably the chief reason why many adults remain gun shy on the humble sprout, so I wanted to make sure they would still have sufficient bite, too. In a cast iron pan I rendered a few strips of bacon cut into lardons until they were golden brown and set them aside to drain. 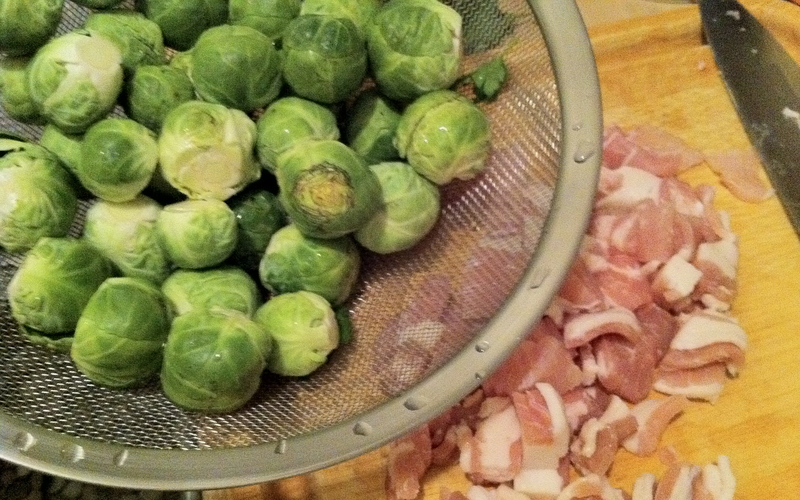 Keeping the hot bacon fat on medium-high heat, I tossed about a pound of trimmed and halved brussel sprouts. Letting them cook for a minute, I thought a nutty component would be a nice addition. I was out of walnuts – which seems to be the traditional roast pairing – so in went a good handful of coarsely chopped pecans. A few cloves of finely minced garlic, too, to give it a little kick, and a big pinch of salt. I needed to braise the sprouts and get all those yummy brown bits off the bottom of the pan, so to deglaze I added some heavy cream and let it reduce by half before adding the bacon back in. To finish, a few tablespoons of maple syrup to counter the sharpness of the sprouts and complement the pecans along with a generous squeeze of lemon juice. Total time: 10 minutes. 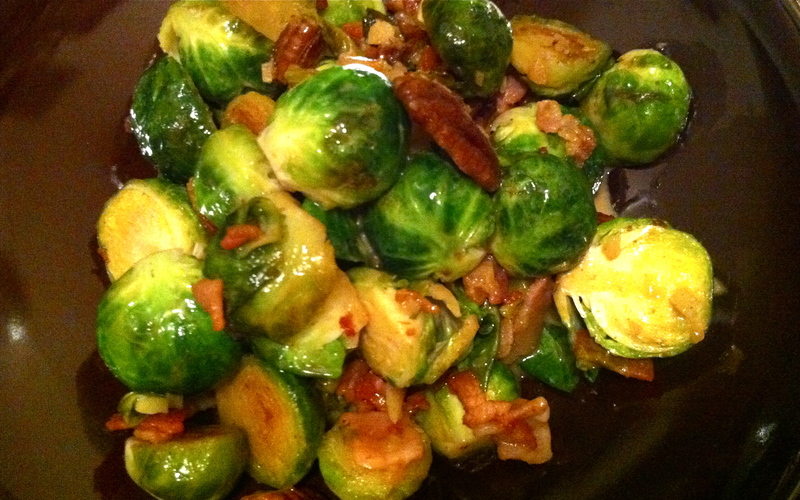 The sprouts retained a great crunch and if I do say so myself, the pecan/maple/garlic/lemon combination was a fortuitous stroke of genius: savory with just a hint of sweet, I could have easily gobbled them all. And not a mushy one in sight.